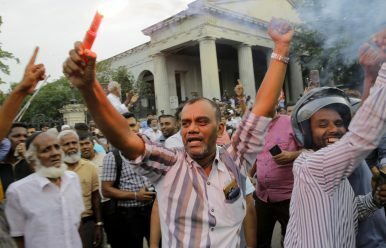 Supporters of ousted Sri Lankan Prime Minister Ranil Wickremesinghe celebrate outside the supreme court complex in Colombo, Sri Lanka (Dec. 13, 2018). Sri Lanka’s Supreme Court ruled unanimously Thursday, December 13, that President Maithripala Sirisena’s order to dissolve Parliament and hold new elections was unconstitutional, a much-anticipated verdict that further embroils the Indian Ocean nation in political crisis. A seven-judge bench said the president lacks the power to dissolve Parliament at will before four-and-a-half years from the day of its first sitting, citing the 19th constitutional amendment passed in 2015, according to opposition counsel Jayampathy Wickramaratne. As Umesh Moramudali explained earlier this week for The Diplomat, the 19th amendment was an attempt to curb excessive power vested in the presidency – but Sirisena, despite backing the amendment originally, is now seeking to use his powers to override parliamentary opposition like his predecessors. Sri Lanka’s crisis began in October when Sirisena abruptly sacked then-Prime Minister Ranil Wickremesinghe and appointed former strongman Mahinda Rajapaksa – Sirisena’s rival in the 2015 presidential elections – in his place. The move was the culmination of years of infighting over Wickremesinghe’s economic reforms and his efforts to investigate abuses during Sri Lanka’s long civil war, which ended in 2009. The military under Rajapaksa has been accused of some of the alleged abuses. “This is a historic judgment delivered by the Supreme Court; for the first time an act of the president has been challenged. That was possible because of the 19th amendment. Prior to that when the president was in office, he had full immunity,” said M.A. Sumanthiran, an opposition lawmaker and lawyer who argued for the petitioners. “We are glad that the conclusion arrived at is unanimous,” he said. While political norms dictate that Sirisena respects the verdict, the court has little ability to force him to do so, legal experts said. Before the ruling came down, Sirisena had pledged to respect the Supreme Court’s decision. Since then Rajapaksa has been defeated twice in no-confidence motions in Parliament and has had his and his ministers’ budgets stripped by majority votes. However, his supporters have declared those votes invalid, accusing the speaker of Parliament of not following proper procedure. Parliament has been the scene of violent clashes between the rival political factions at times. Sirisena has resisted calls to reappoint Wickremesinghe, ignoring warnings that such a refusal could amount to a breach of the constitution. The president insists that he will never accept Wickremesinghe as prime minister again, even though Wickremesinghe on Wednesday won the support of 117 members in the 225-member Parliament to function as prime minister. Lawmakers could attempt to impeach Sirisena, but that requires a two-thirds majority vote in Parliament, and Wickremesinghe commands only a simple majority. Last month’s no-confidence votes against Rajapaksa descended into chaos, with his supporters occupying the speaker’s chair and throwing books and water mixed with chili powder to try to prevent a vote. The speaker announced that the votes were passed by voice and that there was no longer a prime minister or Cabinet. However, Rajapaksa continued in office with Sirisena’s backing. Lawmakers opposed to Rajapaksa filed another petition at the Court of Appeal, which ordered him and his ministers to stop functioning in their positions until the case is concluded. By Krishan Francis for the Associated Press with additional reporting by The Diplomat.